Ever Dreamed of Being 007? If your like most guys I'm sure you've Dreamed of Being 007! Having the cool and exciting life with cool gadgets, beautiful women, and especially…. awesome cars. Well if you have millions to spare, RM Auctions will be obliged to help you get into a Real James Bond Car! A 1965 Aston Martin DB5 that was driven by Sean Connnery and used in the movies Golfinger and Thunderball will be auctioned on October 27th. The car comes with “Q” Branch gadgetry befitting a Secret Agent of Her Majesty's' Service. It comes factory-fitted with the full complement of operational gadgets, including machine guns, bullet-proof shield, revolving number plates, tracking device, removable roof panel, oil slick sprayer, nail spreader and smoke screen, all controlled from factory installed toggles and switches hidden in the center arm-rest. It would be pretty cool to drive this around in Traffic! This is the first time the car will be for sale in about 40 years. It's been in the possesion of Jerry Lee, who is a radio medial mogul, all of this time. He kept the car in a special “James Bond” room in his house and few people have seen it. Many expect the car to bring in at least 5 Million Dollars or more. I'm guessing that it will go for around $8-10 Million easily. After all this isn't just a collector car, but a fine piece of Cinema History. The proceeds for the auction will go to Jerry Lee's Foundation, that helps solve urban crime. I should book a flight to London, and starting saving my money! LONDON (1 June, 2010) – PAY ATTENTION, BOND FANS! RM Auctions announces the consignment of one of the most significant cultural icons of the 20th century – the 1964 Aston Martin DB5 James Bond movie car – to its annual ‘Automobiles of London’ event at the Battersea Evolution in London on 27th October, where it is available for sale for the first time in history and expected to achieve in excess of £3.5 million GBP (over $5 million USD). The car is being offered by RM in association with Sotheby’s, with whom RM has worked in the past. Well-known around the world by its original UK registration number, FMP 7B, this Aston Martin is one of only two, and the sole remaining, of the original ‘007’ DB5s as featured on screen with Sean Connery behind the wheel in the enormously popular Goldfinger and Thunderball movies. With its ‘rather interesting modifications' originally conceived by Oscar-award-winning special effects expert, John Stears, this authentic Bond movie car is factory-fitted with the full complement of operational ‘Q-Branch’ gadgets, including machine guns, bullet-proof shield, revolving number plates, tracking device, removable roof panel, oil slick sprayer, nail spreader and smoke screen, all controlled from factory installed toggles and switches hidden in the center arm-rest. 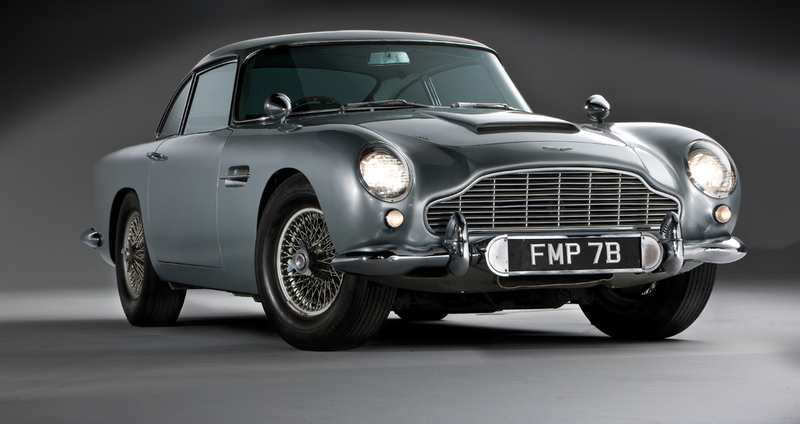 The DB5 was originally loaned to EON Productions for the filming of the two Bond movies, and returned to the Aston Martin Lagonda factory after its subsequent promotional tour. Mr. Jerry Lee, an American radio broadcaster based in Philadelphia, PA, convinced the factory to sell FMP 7B to him for $12,000 in 1969, thereby becoming its first and only ex-factory owner. It has remained in his possession and has rarely been seen publicly over the past 40+ years. Today, FMP 7B is presented in highly original condition and recently underwent a careful re-commissioning program by RM Auto Restoration, returning it to running condition after the many years of static display in Mr. Lee’s home. Posted on Author adamCategories UncategorizedTags 007, Aston Martin, auction, DB5, goldfinger, james bond, jerry lee, thunderballLeave a comment on Ever Dreamed of Being 007?